We do therefore, with the Advice of our Privy Council, declare it to be our Royal Will and Pleasure, that no Governor or Commander in Chief in any of our Colonies of Quebec, East Florida, or West Florida, do presume, upon any Pretence whatever, to grant Warrants of Survey, or pass any Patents for Lands beyond the Bounds of their respective Governments, as described in their Commissions: as also that no Governor or Commander in Chief in any of our other Colonies or Plantations in America do presume for the present, and until our further Pleasure be known, to grant Warrants of Survey, or pass Patents for any Lands beyond the Heads or Sources of any of the Rivers which fall into the Atlantic Ocean from the West and North West, or upon any Lands whatever, which, not having been ceded to or purchased by Us as aforesaid, are reserved to the said Indians, or any of them. To avoid warfare with the Indians. This aim had little to do with affection for the tribes, but simply reflected the facts that Indian conflicts were very expensive and that the British had not yet deployed sufficient soldiers in the west to keep the peace. Some Indians welcomed this policy, believing that the separation of the races would allow them to resume their traditional lifeways; others realized that the proclamation, at best, would only provide some breathing room before the next onslaught of settlers. 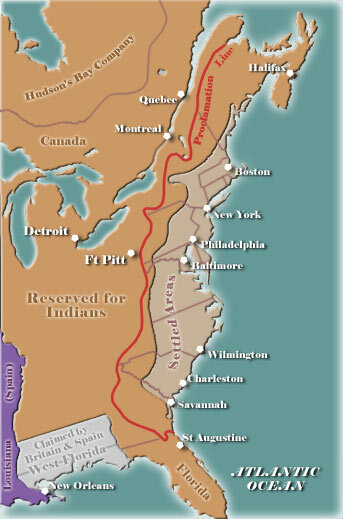 To concentrate colonial settlements on the seaboard where they could be active parts of the British mercantile system. The first priority of British trade officials was to populate the recently secured areas of Canada and Florida (see Treaty of Paris), where colonists could reasonably be expected to trade with the mother country; settlers living west of the Appalachians would be highly self-sufficient and have little opportunity to trade with English merchants. The reaction of colonial land speculators and frontiersmen was immediate and understandably negative. From their perspective, risking their lives in the recent war had been rewarded by the creation of a vast restricted native reserve in the lands they coveted. Most concluded that the proclamation was only a temporary measure and a number ignored it entirely and moved into the prohibited area. Almost from its inception, the proclamation was modified to suit the needs of influential people with interests in the American West. This included many high British officials as well as colonial leaders. The colonists, however, were not appreciative and regarded the new policy as an infringement of their basic rights. The fact that western expansion was halted at roughly the same time that other restrictive measures were being implemented, made the colonists increasingly suspicious.